[Festo] have come up with yet another amazing robot, a swimming one this time with an elegant propulsion mechanism. They call it the BionicFinWave. Two fins on either side almost a body-length long create a wave which pushes water backward, making the robot move forward. It’s modeled after such fish as the cuttlefish and the Nile perch. What was their elegant solution for making the fins undulate? Nine lever arms are attached to each fin. Those lever arms are controlled by two crankshafts which extend from the front of the body to the rear, one for each side. A servo motor then turns each crankshaft. Since the crankshafts are independent, that means each fin operates independently. This allows for turning by having one fin move faster than the other. A third motor in the head flexes the body, causing the robot to swim up or down. There’s also a pressure sensor and an ultrasonic sensor in the head for depth control and avoiding objects and walls. While these allow it to swim autonomously in its acrylic, tubular track, there is wireless communication for recording sensor data. Watch it in the video below as it effortlessly swims around its track. [Festo] has created a lot of these marvels over the years. We’ve previously covered their bionic hopping kangaroo (we kid you not), their robot ants with circuitry printed on their exoskeleton, and perhaps the most realistic flapping robotic bird ever made. This is the kind of engineering that gets us excited, and not just because we like machines modeled on living things. 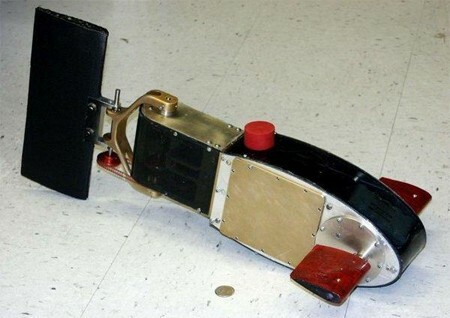 Science Daily reports that Associate professor [Kristi Morgansen] from The University of Washington has developed these robofish for underwater data collection. Her technology is notable for two major reasons: the small robots use fins for locomotion instead of propellers, which reduces drag and creates greater maneuverability. The second and more important reason is that the robofish can communicate with each other via sonar, largely obviating the need for the robofish to surface for more instructions. Both design concepts were inspired by the shape and behavior of real fish. Currently the robots are only programmed to swim with or away from each other, but these are still prototypes and the technology looks promising. For more tech specs on these “Fin Actuated Autonomous Underwater Vehicles” (see why Robofish is better? ), you can have a look at Morgansen’s notes.